THIS FREE EVENT IS FULLY BOOKED. The waiting list is currently closed. If you no longer need your ticket, please cancel it so it can be offered to someone else. We will be running a returns queue on the night, where any empty seats will be offered to those waiting without a ticket on a first come, first serve basis 5 minutes for the start of the event. Only make the journey if you are happy to queue and not get in. Please note that due to heightened security we cannot guarantee access to latecomers and additional safety measures such as bag checking will be taking place. Please do not bring large items or bags with you. As former Prime Minister and our longest-serving Chancellor, Gordon Brown has been a guiding force for Britain and the world over 40 years. His memoir, My Life, Our Times, reflects candidly on an extraordinary career from New Labour’s 1997 landslide electoral victory, to the 2008 global financial crisis and the historic 2014 Scottish and 2016 European referendums. He talks about this and more – the coalition negotiations of 2010, Britain and Europe – as well as his many years at the Treasury where he equipped Britain for a globalised economy, introduced the minimum wage, gave independence to the Bank of England and refinanced the NHS. His role in government continued to shape his views on the importance of education as a fundamental right of every child in the world and the key to unlocking better health, greater social stability, more rights and opportunities for women and a higher standard of living. He is a passionate advocate for global action to ensure education for all and has served as the UN Secretary General’s Special Envoy for Global Education since July 2012. He works closely with key partners to help galvanise support for the UN’s Sustainable Development Goal 4 to achieve quality, relevance, and inclusive education and learning for every child. He is Chair of the High Level Steering Group for the Education Cannot Wait fund for education in emergencies, Chair of the Inquiry on Protecting Children in Conflict and also serves as Distinguished Global Leader in Residence of New York University. 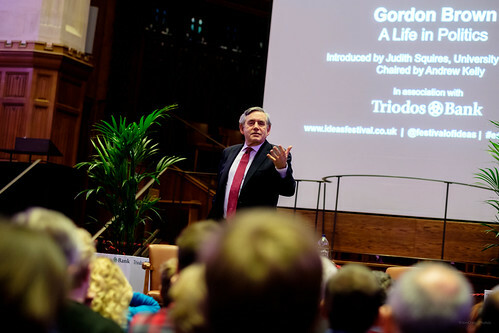 Gordon is the author of several books including Beyond the Crash: Overcoming the First Crisis of Globalisation; My Scotland, Our Britain: A Future Worth Sharing; and Britain: Leading Not Leaving – The Patriotic Case for Remaining in Europe.